"I was afraid," says Sarah Lutz-Simon, head of the MSF emergency team in South Kivu, Democratic Republic of Congo (DRC). "When we arrived at the health centre, they had put 40 sick children together in one room, in the dark. The image was hard to take in: they were weak, with red eyes, runny noses and rashes on their skin." Measles has reappeared in DRC at an alarming rate, with alerts of outbreaks in different parts of the country. Our emergency teams have recently faced an outbreak of the disease in Mulungu, South Kivu, a remote area in the turbulent eastern province of DRC. In response, they have vaccinated 4,165 children. The highly contagious viral disease is one of the leading killers of young children worldwide, despite it being easily preventable. A member of the emergency team vaccinates a child in Mulungu. Sarah's team was "seeing a very rapid increase" in the number of measles cases in South Kivu: they had already seen 10 patients in December, with the number rising sharply in recent weeks. In response, they created isolation zones in order to free up health centres and start treatment. The temporary isolation centres we create are basic, consisting of 10 beds made of wood which are covered with plastic. Because there is no anitviral treatment for measles, our medical staff try to prevent dehydration, monitor fever and manage any complications that may arise from measles, including eye and ear infections among others. Three centres were built in different areas in Kivu in the space of one month. Additionally, six teams were deployed to begin vaccinations in villages as soon as possible. This would act as a firewall against infection to eventually halt the spreading of the disease. 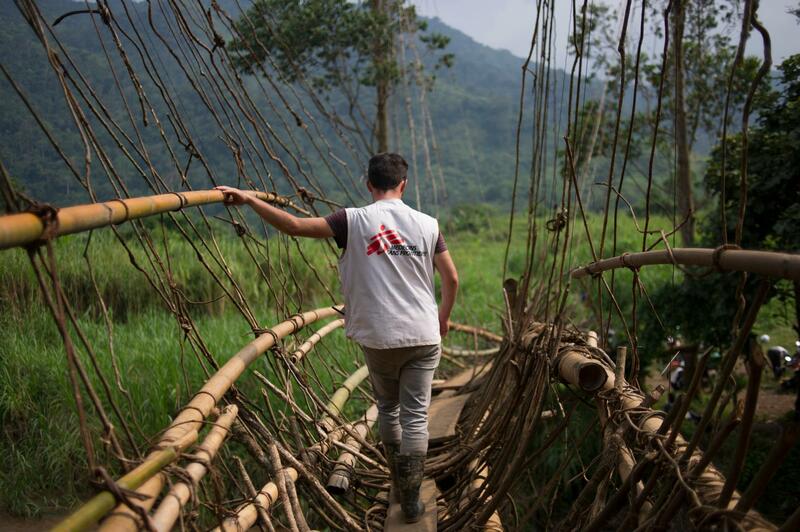 One of the toughest challenges for our emergency team was dealing with the area's terrain: thick jungle, unpaved roads, and long distances between villages made it difficult to respond to the measles outbreak. It took them two days to drive from the capital, Bukavu, to Bisisi, and from there a futher five hours to walk along trails to get to Idunga (a village). "It's not only the geographical distance and obstacles - hills, mountains, swollen rivers, lack of roads, mud, jungle - but also the presence of armed men, which make access to health even more complicated in this area." "That was the easy part," says Sarah. "Some of the teams had to walk from Idunga for three days to reach the remote areas." At one point our staff had to cross a bridge made out of vines. Given the swelling of the rivers, and serious doubts over its stability, staff safety needed to be assessed. However, they finally managed to cross it along with all of the equipment. We enrolled several hundred residents of the area to work as porters. In conjunction with the Ministry of Health, they also helped with measles vaccinations, securing 94 percent coverage. They also informed the population and treated the cases presenting the most complications. Another challenge of working in South Kivu is the number of armed groups in the area. We spoke with every one of the small groups based in each particular area, so that our team could gain access to vaccinate and treat the people who were ill.
Porters carry sacks containing vaccination equipment over a bridge of bamboo and vines from a previous vaccination campaign in DRC in 2014. “It’s not only the geographical distance and obstacles — hills, mountains, swollen rivers, lack of roads, mud, jungle," says Sarah. "It is also the presence of armed men, making access to health even more complicated here." Sarah notes that the mass measles vaccination campaign in South Kivu has been of enormous importance to her. “The impact is immediate," she says. "We’ve saved many lives. People were very happy because they were really worried about the outbreak and they had only received aid sporadically. "Seeing the number of affected people decrease in such a short time following vaccination is the best thing." Children between six months and 15 years were vaccinated against measles, pneumococcal bacteria, hepatitis, haemophilus, diphtheria, tetanus and whooping cough. In total, 352 children were treated and two deaths were recorded: one on the day that MSF arrived in Itanga, and another in the case of a child whose family had resorted to local healers. Besides measles, children in the Mulungu area were also vaccinated against pneumococcus, hepatitis, haemophilus bacteria, diphtheria, tetanus and whooping cough, in a new combination of antigens used for the first time in the province. The teams are now prepared to tackle new alerts of measles.